How long has it been since you've been stopped by a moving train? With the hustle of traffic these days, it doesn't happen often. Bypasses, overpasses, and tunnels have almost made waiting on trains a thing of the past. But today after my meetings, I drove to the co-op for chicken feed. The co-op is located down by the railroad tracks. I could have dodged the train and drove several blocks to the viaduct, but instead I cut the engine, rolled the window down and watched the train rumble by. The day was warm, but a breeze out of the west was refreshing. The Northfork-Southern engines passed the dinging crossing gates dragging a caterpillar of cars behind. Tank cars were up close to the engine, but behind were boxcars. 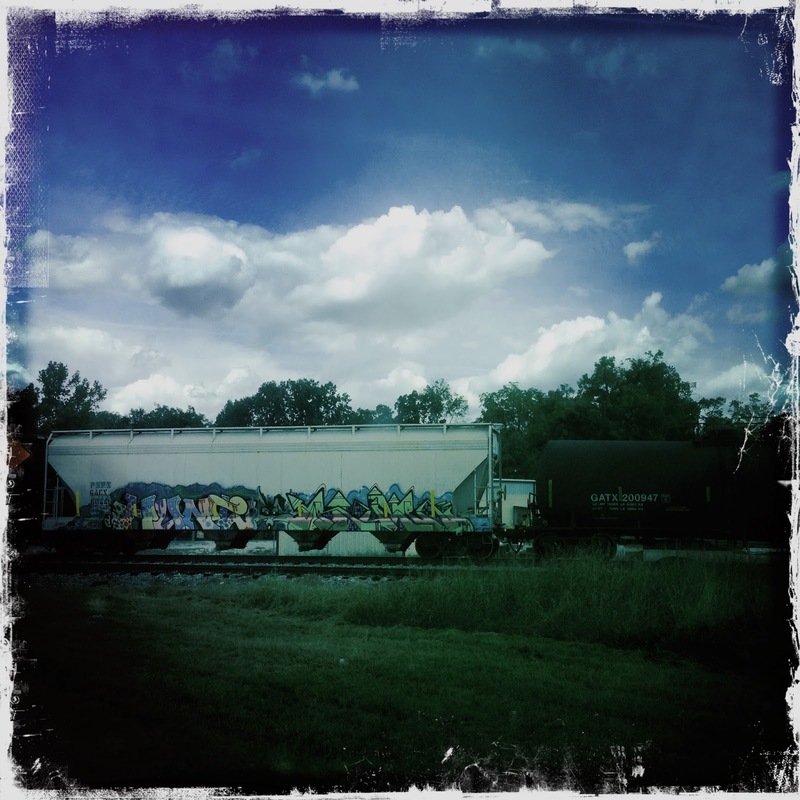 Almost every boxcar had word art sprayed on the sides. It occurred to me that these boxcar painters were urban artists. Once their work is finished, it crawls across America to not only the big cities but also small towns. As the train passed, I snapped a few pictures through the windshield of my truck. Leaning my chin on the steering wheel, I watched as the cars passed. Some of the artwork was so old, it faded to a shade of rust, and some of it was so fresh you could almost smell the acrylic. I thought to myself that trains give the artists a silent voice. Their work may never make it to a museum, but they can rest assured that people from all across this great country has seen their work. Some of those artists are very talented. Unfortunately most really stink and their graffiti is a major eyesore. NYC somehow doesn't have it much anymore, the subway cars used to be covered. I am amazed at the quality of some of the graffiti I've seen. Some is garbage but some is really fascinating!! Watching the train go by was one of the joys of childhood. It was always a treat if we could get the engineer to blow the whistle. I get stopped for trains regularly here. It is fun to see some of the graphics on them. Some people get upset when they get stopped, but I see it as an opportunity. I hate graffiti! Sure a few graffiti artists like Basquiat had real talent but most of it is just a visual blight. But I guess graffiti has always been with us; it's been found inside the pyramids, left by builders during construction.